This weekend, CatCon—the convention for people who love cats—returns to Los Angeles. Visitors will brush paws with Lil Bub, Pudge, and Nala cat, hear from cat behaviorists and other feline-related speakers, adopt kitties, and, of course, buy some really awesome cat stuff. Here are a few things you might want to pick up if you’re at CatCon this weekend (and where you can buy everything if you won’t be there). The whole process took around six months and resulted in two flavors: Pinot Meow—“it was a red wine and I'm a lover of red wines myself,” Zavala says—and MosCATo, a yellow wine that came about when Zavala’s partner, Zoe, suggested they use yellow beets. A third cat wine, White Kittendel—which uses Valerian rather than catnip—will debut at CatCon. Can’t make it to the convention? Buy some cat wine here. Ailurophiles obviously love their cats, but they’re probably not as enamored with a requirement for feline ownership: the litterbox. Many would love nothing more than to hide these unsightly poo receptacles—and with CURIO Cabinets, they can hide a litterbox stylishly. 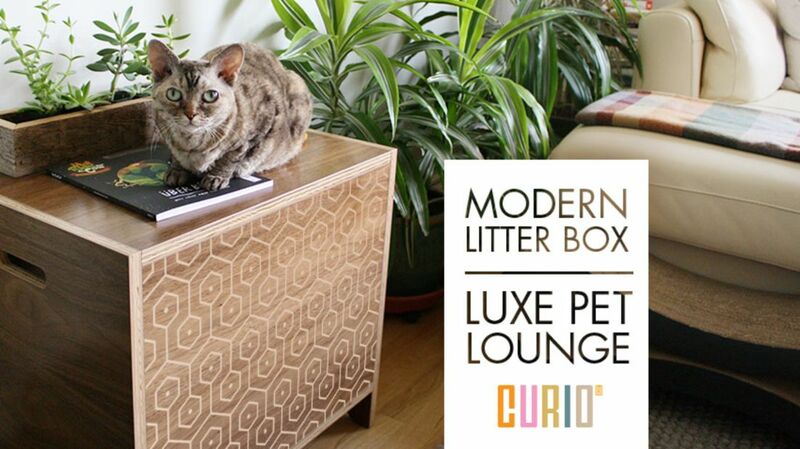 The duo spent a year crafting the perfect litter cabinet, and they had a few goals in mind: Their cabinet would be “a piece of furniture, instead of purely as a place for cats to do their business,” Fagan says; it would meet the functional needs of the cat without sacrificing the aesthetics important to cat owners; and it would be “a complete litter box solution that improved upon litter management.” That meant not just creating the cabinet, but the liner to go inside it. “Our Litter Liner is a huge improvement over traditional litter pans,” Fagan says. The box also needed to be affordable and easy to ship. These days, Chunkers and Dolly have two CURIO Cabinets, “one as a litter box and one as a cat lounge where they hide their favorite toys,” Fagan says. CURIO Cabinets, which come in three designs and are made with real wood, ship flat and can be assembled with just a screwdriver. Can’t make it to CatCon? You can still get a CURIO cabinet by visiting their website or Etsy shop. You could get a regular cat scratcher, but why do that when you can get one that’s a little more whimsical? Kafbo’s cardboard scratchers are adorable—choose from a whale, a walrus, a rooster, a mouse, and more—affordable, and eco-friendly. If you can’t make it to CatCon, you can still buy one at their website. Wendy Casazza Scruton started making kitty sunglasses sort of by accident. She’d already been making cat hats—her first was inspired by Princess Beatrice's royal wedding fascinator—when she decided to make some kitty looks inspired by pop culture icons. Her initial inspirations were Kanye West and Lady Gaga, which evolved into “Katye West” and “Kitty Gaga” designs. These days, she’s also inspired by things like nerd culture and the holidays, and she offers all kinds of kitty shades at her Etsy shop, NotSoKitty. All of the proceeds from these durable—and adorable—cat houses go to the ARNI Foundation, a no-kill shelter in Daytona Beach, Florida, that rescues animals from other shelters before they’re euthanized. You can grab a Kitty Kasa for your favorite feline here.